Some of the tools I carry in my Stylist’s Kit are handy items that everyone should have in their personal arsenal. Below are my top recommendations, including my favorite brands of each and where to buy. Jiffy Steamer E-Steam Personal Handheld Steamer, purchase here; Canvas bags by Fairhope-based MB Greene (Marguerite’s Conceits, $76 & $28). I discovered this little baby 20 years ago when I first began my career, assisting backstage at Parisian runway shows. Unlike the wimpy handheld steamers I had tried in the past, which seemed to spit more water than steam, at 120 volts the Jiffy E-Steam is the most powerful handheld steamer on the market. When Parisian corporate closed its doors (RIP), I was gifted the E-Steam I had used, and it ran steady and strong for 5 more years, right up until it was swiped from an event! (Clearly someone knew the jewel that it is.) Not to be deterred, this just gave me the opportunity to upgrade to a pink model. While I do own a full-size industrial steamer, its cumbersomeness makes it less than fun to cart around, so I find that I more often use my handheld, including for personal use at home and when traveling. The only difference in performance is that the handheld has to be refilled about every 15 minutes. Tip: Use distilled water to keep the minerals in tap water from gunking things up over the long run. Downy Wrinkle Releaser, purchase here; Jealous Tomato top ($50, Belk). Wrinkle-release spray will change your life. As a committed non-ironer, I rely on this stuff quite frequently. I first tried it out of necessity when styling a beach photo shoot without electrical outlet access. Soon after, a bottle of the Downy variety (the easiest to find, at Publix and online as listed in the caption) became a staple in not only my Stylist Kit but also my closet, laundry room and suitcase (it comes in travel size!). Tip for use: Don’t be afraid to saturate the fabric, unless pure silk (which I have not used it on). Spray the wrinkled area, then use both hands to pull taut. After a few tugs, let dry and be amazed as the wrinkles disappear! Seam ripper, purchase here; Harvest Jewels pave diamond bangles, ($1270 & $1750, Regina Jewelry & Treasures at Gus Mayer). When I ask clients if they have a seam ripper, most of them respond with a look of bewilderment. 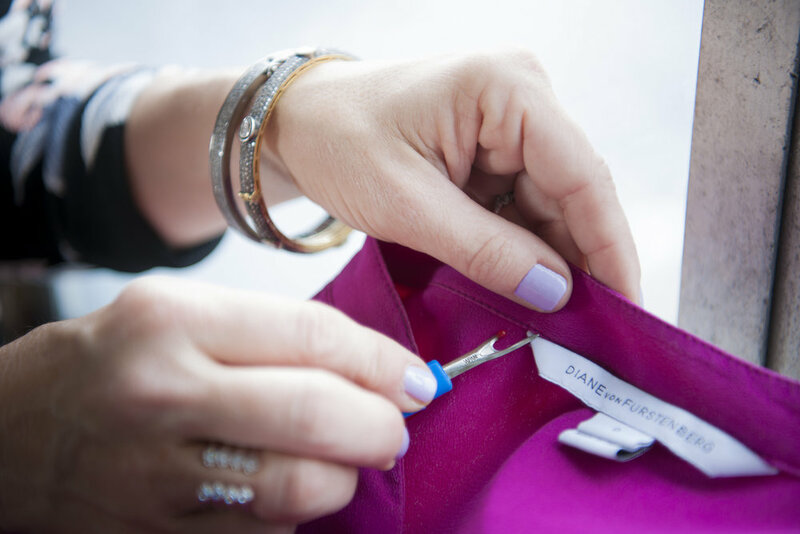 A seam ripper is that thing you need to cut the thread on the vent of a new skirt or blazer or to remove the itchy or visible tag out of a garment. You know, the things you have used scissors for in the past but probably damaged the garment while using or as a result weren’t able to completely remove the tag, making that itchy situation worse? This is one of those tools you didn’t even know you needed then will wonder how you lived without. 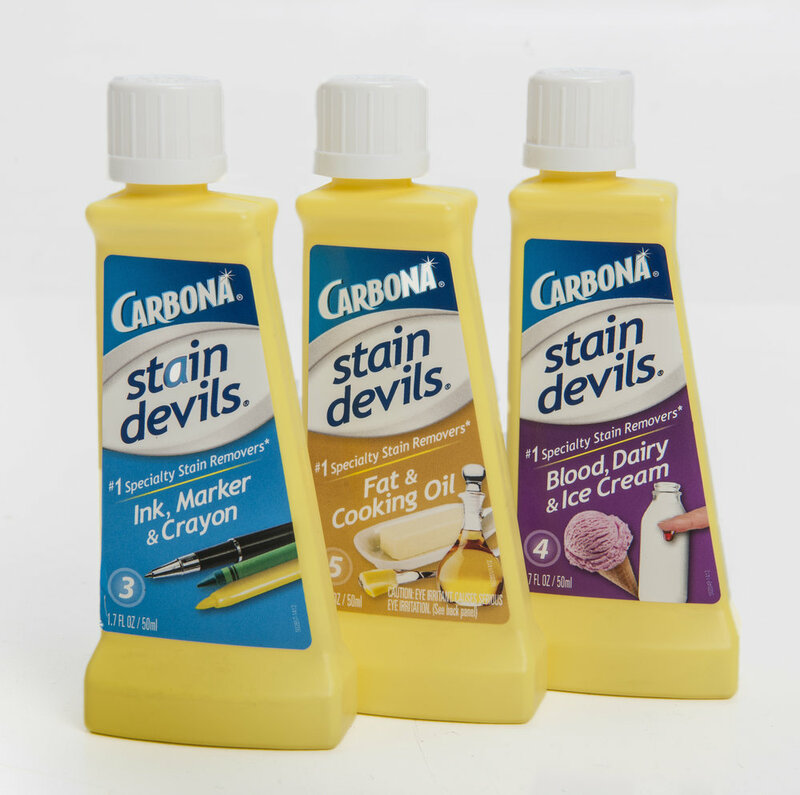 Carbona Stain Devils, purchase here. I’m no Messy Marvin, but every once in a while a stain will show up on a clothing item that regular washing and even OxyClean will not deter. Desperate for a solution, I thankfully found Carbona’s Stain Devils, a line of stain removers specially formulated for different kinds of stains: dairy, oil, grass, ink and so on. Genuis! Publix has recently started carrying a few of the formulations, or go online (see link in caption) to buy a set so you will be ready to conquer any kind of stain! Evercare Fabric Shaver, purchase here. Ah, the dreaded clothes pilling. So what causes these ghastly little fuzz balls? Fabrics consist of either long fibers or short fibers and, generally, short fibers — like cotton — are more likely to pill. There are more tiny ends (as opposed to one long, continuous fiber, like silk) that can get tangled together and create pills, which usually happen when the fabric is rubbed or abraded somehow. Another factor is twist. In other words, how tightly the fibers are held together in the garment. The higher the twist, the firmer the feel of fabric. Pilling occurs on a lot of loose knits because there's more area for the abrasion to take place, and it's not as tightly twisted. One solution is to hand wash garments or machine wash inside out. Even then, pilling will occur, making a fabric shaver is a must. While manual options exit, as simple as a straight razor, my go-to is Evercare’s battery operated version, which includes a compartment in the handle that catches the fuzzballs you pick up. (Emptying this little bin is very gratifying indeed.) Also included is a plastic guard to put over the blade face when running over delicate garments like cashmere. Tip for use: Don’t think you can de-fuzz a garment right before wearing. Depending on the amount of pilling, a sweater can take anywhere from 10 to 20 minutes of shaving to truly revive the look. So gather the culprits and camp out in front of the TV to shave away while you binge watch the latest show on Netflix. F'lint Travel Lint Roller, purchase here; 7 for All Mankind The Ankle Skinny Jean in English Botanical Print, ($199, Belk). If you have a pet, you are likely no stranger to a lint roller. Even without animals around, lint is an unfortunate given. I love the surface area my good ol’ 3M roller allows, but it is not conducive to carrying in ones purse, unless you want to pull out your lip gloss in the bathroom of a chic restaurant with your lint roller attached. F’lint is a cute, colorful, reusable, refillable, and more importantly, retractable lint roller. Keep one in your purse and car to keep your clothes looking kempt and polished.